This contemporary compact coffee table design has a slight Japanese influence. A relatively easy project, there are nevertheless some critical design features that need to be thought about as you make it. First, saw all parts over size and plane and thickness; plane only one edge of each as the top, shelf and ends are all joined from two pieces of board each. Make sure these meeting edges are truly square before biscuit jointing them and gluing up with PVA. The biscuits' only function is a locational one, in order to get nice flush faces. Position them so they won't get exposed when these boards are trimmed to size. Cramp up, check for flatness and leave to dry. It is wise to use paper on the sash cramps to avoid surface staining due to iron contact if you use oak. Once dry all these boards will need flatting with a belt sander. If there is any degree of unevenness in the surfaces you may need to do the unthinkable and belt sand cross grain. Once levelled in that direction, revert to normal sanding with the grain. However, the cross grain scratches won't go away, so later on a random orbital sander will be necessary, using several different grades of increasingly finer abrasive grit, so as to remove these unwanted scratches. Even more importantly, because the whole underneath part of the table will be dyed dark, the dye will pick out any remaining scratches. Now size all components exactly; note that the shelf and the stretcher have dovetailed ends to fit the leg housings, meaning that you must add these amounts to the finished sizes. In order to be able to do that you need to know which housing cutter you intend using. This is a job for a big cutter in a 1/2in-shank router mounted in a suitable table. The cutter I used is years old and doesn't get a great deal of use as dovetail housings aren't an everyday event. It is a Wealden TCT bit, 19mm at the fat end, and I allowed for a 10mm depth of cut, so in my case it was component length + 10mm x 2 to give the finished size. 1 Use a crosscut blade when sizing parts so the finish is reasonable, then do one or two passes over the planer to finished size. Leave the end grain sawn to avoid tearout as would happen on the planer. The stretcher needs to be thicknessed to final width. 2-3 The next task is to set up the router table for bevelling the edges. The degree of bevel is a matter of taste but the legs have a larger bevel than the shelf and stretcher's smaller one. It doesn't matter whether you use a bearing-guided cutter or not so long as the fence and cutter height are set correctly. As always use scrap stock to check the result first. 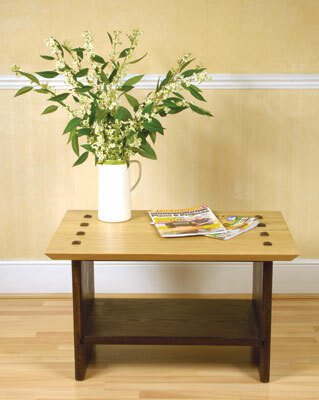 The bottoms of the legs are also bevelled to sit nicely on carpet and to make it possible to move the table around. 4 The top is a different proposition, needing a very large undercut bevel with a very minor one on the top edges. Do the latter first, using a smaller router and bearing-guided cutter. Next, set up the sawtable with the blade angled at 40 degrees to give a more subtle result. Different sawtables will angle the blade arbor either left or right depending on the machine, so how you achieve a regular, neat bevel will be determined by this. 5 In my case I used the dimension table and fence to feed the top blank forward while using an offset block against the rip fence. This meant each side was cut correctly as the block was pressed against the top edge of the blank. 6 Even so, although the result was good it still needed one pass at 0.5mm setting with a hand electric planer and then a belt sanding all round. Now comes the dovetail housing, and for this you will need a jig and a suitable guidebush in your router, usually 30mm diameter, see panel for setup and use. Before final underframe assembly sand all surfaces thoroughly until all cross-grain scratches have gone. Apply glue to both halves of the housings and tap gently together. Ensure the shelf is centred on the legs and the stretcher sits flush with the top of the legs. 7 Cramp-up square, then using a damp cloth, wipe off the surplus glue and leave to dry. Fine sand down to 320 grit where there are dried glue-wetting marks, ready for dyeing. Oak calls for a fairly neutral dark-brown dye, certainly not one with a reddish hue. There are different sorts such a naptha (oil-based), spirit or water-based, and I chose Vandyke brown spirit dye as I wanted a non-grain-raising dye that wouldn't react badly with cellulose sanding sealer. 8-9 Apply the dye with a formed pad of rag or a brush and work very quickly, avoiding runs. Do this until the wood has absorbed all possible dye evenly. Wipe off thoroughly, finishing with the grain, and allow plenty of time for it to dry. 10 The photographs show the principal of the jig. It is a wide-bladed 'T' square with a slot running most of the length, allowing the guidebsh a smooth run. 11 You can create this slot on the circular saw but the cut must stop short of the other end. For the stretcher housing a batten is screwed across in the correct position, thus stopping the router from machining too far in. 12 Get the router set up and set the cut depth with it sitting in the housing jig and the cutter resting on the workpiece. Withdraw the router, plunge and lock at the preset depth and switch on. Slide in to the jig and machine a bit over halfway. The clamps you have used will stop you doing the last section; even if you could run through you would get breakout on the far side. 13 Withdraw the router but do NOT unplunge and switch off. Move the clamps, now sit the router on the gap at the far end of the jig, switch on and machine into the middle until the cuts overlap. Withdraw the router and switch off. Unplunging while in the workpiece will of course cause damage to the work. Now comes the tricky bit, machining the actual dovetails. Dovetail housings are very strong but getting a neat fit is harder, especially as each board you have belt sanded will probably be a very slightly different thickness. Use offcuts to check the fit; don't try it with the actual components. A high fence is needed to support the boards in vertical mode and the stretcher needs a close-fitting insert around the cutter and a 'breakthrough' subfence for maximum support. You are aiming to get the correct cut height and depth on both sides of your scrap pieces. 14-16 Check the fit in the housings which have already been cut. When it seems to be a comfortable fit, machine one dovetail joint and see how well it fits. If it is too tight set the fence back a fraction; if it's too loose then I'm afraid you are relying on glue too much, so better to make too shallow a cut and adjust it afterwards. Repeat the cut on all joints and do a dry assembly. Note: the stretcher needs one end trimmed back and rounded with a chisel to allow it to fit the housing neatly. 17 Drill the plug holes using a suitable sharp spade bit to a depth of 10mm or so. 18-19 Square out the holes with a sharp chisel to say 20-24mm square. Use the centre-point hole for centring the drill bit for the screw holes and drill right through into the legs. Now use long twinfast screws to fix the top on, allowing the heads to sink into the wood. 20-22 Almost the last act is to make the plugs bevelling the caps on a disc sander or inverted belt sander, cut to length, apply the same wood dye as the underframe and apply a finish on them. Finally glue and fit them in the plug holes, apply clear finish to the entire top and, bar a light waxing, the job is done. 23 Apply your chosen finish over the underframe, very carefully finishing with the grain. Do this in several coats, allowing each to dry in between and taking particular care with the first coat to avoid disturbing the dye. Sand the top thoroughly and apply a clear finish on the underside. The top can now be fitted to the base using hidden screws. Position it carefully and mark lines where the screws will be, including cross-marks for the individual screws. "A relatively easy project, there are nevertheless some critical design features"